The Great Cortina Hunt. A sad true story. No cream pie if it's a Merit tho. Aye Billy will be all over this. AND there’s an old Vauxhall Astra he might want to look at when he’s done. Bought this about 15 years ago in Derby. The story was, the mother went to the local car dealers after their old 40's car died and asked for the cheapest new car they had to replace it. The 4 was delivered to the house, the son took one look at it and refused to ever drive it. The next time it came out of the garage was when I got it, had 75 miles on the clock. Did some of the work needed and sold it to a collector in Holland. Wow 75 miles. Did it need much work? Dad had a 1974 burgundy R4. 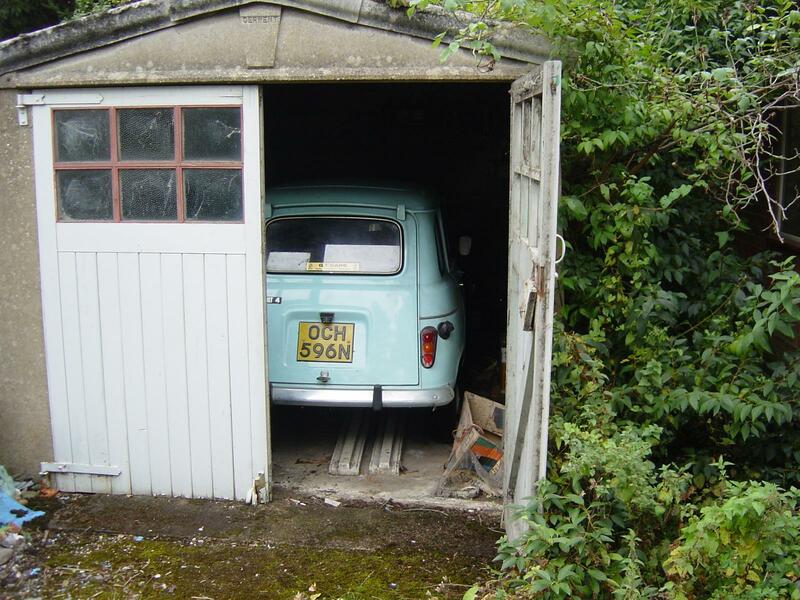 He bought it from a dodgy back street garage in the early 80's with lots of filler and brush painted repairs. It was more holes than car when it died at 12 years old. When I went in it the toe boards were open to the elements and exhaust fumes were in the cabin. I went green. When we stopped I looked underneath and that's when I found out something I never knew: the exhaust on these finished in the front wheel well. As you can see from the first picture, the garage was not the best. The brakes and fuel system all had to be completely replaced, otherwise just service items. The paint and chrome had suffered in places, but worst of all the dealers had covered everything in underseal. Spent days and days washing it off with thinners to reveal mint paint underneath. It was no bargain though,bought for £1500 and sold for £2000 as I remember. God I look young in that picture! 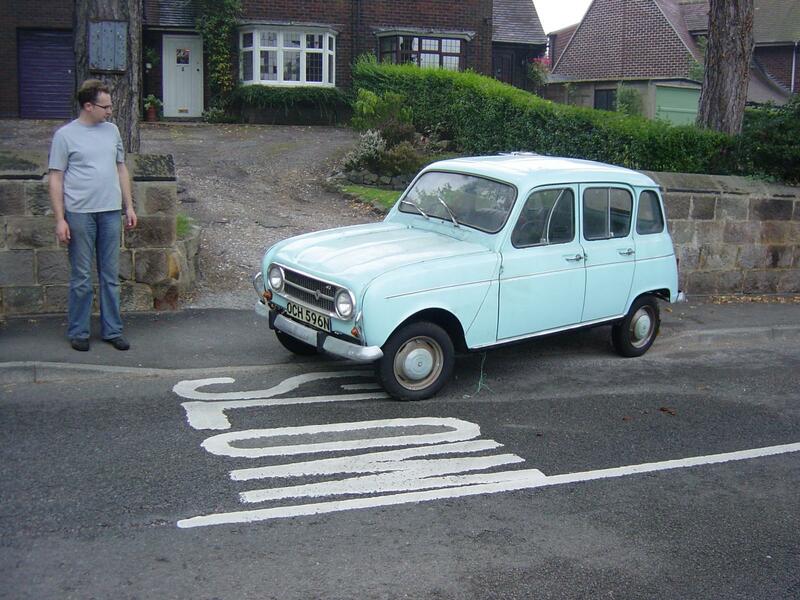 My pop only ever had one brand new car... ever.. a white Renault 4, circa 1980. Only had it a couple of weeks... few too many stiff ones after work one day and he stuffed it on his way home.. It's silly to run a rust-prone classic car when you live near the sea. When I was living in Brighton I paid a massive MoT-related welding bill on a GS and the bodyshop man waved me off the premises with a cheery "see you next year!" The like button isn't big enough for that R4 though! These were still everywhere when I was little and they seemed to disappear overnight. Didn't know he dressed in women's clothes to sizes to big. You learn something every day. Today I was going about my business when I had a pick up down a quiet road, nothing unusual there until I saw the house opposite had bollards blocking the garage, see pic below. Apparently, the place was owned by an old lady who passed away a good few years ago and now her daughter lives there and behind the bollards in the garage lurks an immaculate P reg Astra in silver with an unbelievable 400 miles on the clock! Now I was informed in no uncertain words that the daughter who lives there is a total freak who despite being in her mid 50s dresses in her late mothers' clothes despite them being about four sizes too big for her and loves attending the funerals of total strangers! Now I know it's her property to do with as she pleases but, in my opinion, it's also a total shame to keep this locked up and never use it. Ask her out for me please.